Once your coverage data starts to accumulate, you may find it useful to combine data sets by merging them for easier viewing. By clicking the check-boxes to the left of each completed coverage run in the Execution View, you can select multiple coverage files to merge by clicking the Merge button. Merge -- creates a roll-up of coverage data from this set of executions. This option retains the original executions as components that can later be browsed or removed from the merge as needed. Consolidate -- creates a roll-up of coverage data from the selected executions and deletes the original executions. This options saves space by reducing the number of executions stored over time. This operation cannot be undone. After a merge, the files will be collapsed in the view and identified with the Merge icon. 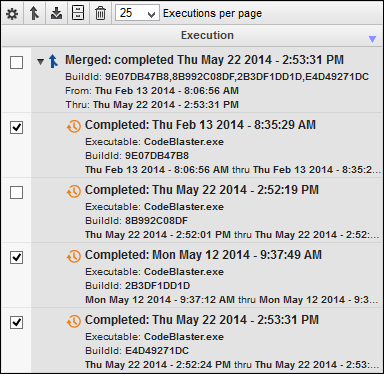 You can still view the executions individually by expanding the tree view of the merged file. You can rename any execution by clicking on the title and selecting the edit icon. 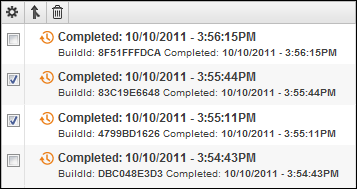 View the coverage logs (if any), by clicking on an execution and then clicking the log icon to display. Once executions are merged, you can still select individual executions in the GUI and delete them. Deleting one or more executions from a merge will also un-merge the entire execution, just as if the top-level merge had been deleted. 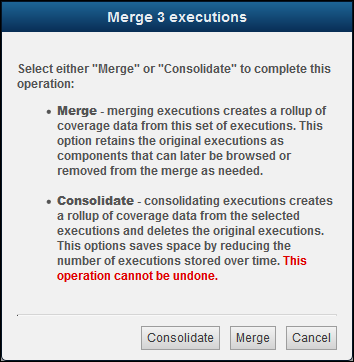 Note: Deleting individual executions from a merge is not possible if the Consolidate option was used to create the merge. On the Executions view, expand the merge. Click the first execution in the merge. Hold down Shift and click the last execution in the merge. Release shift, and click individual executions to de-select them. Click on Merge button again. 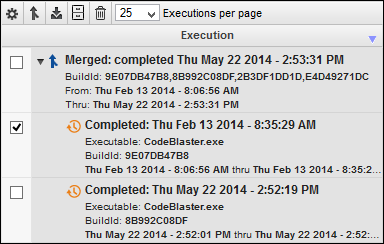 Click on the Merge option and the selected merges will be re-merged, but without the de-selected executions. NCover tags all merges behind the scenes. To view your merged executions, just type "merge" in the Search executions field -- NCover will find and display the combined coverage files in the Coverage Navigator.